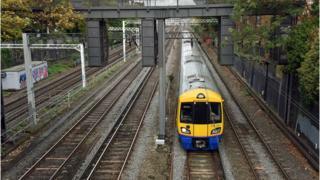 Night-time Overground services have been launched on the East London line. All-night services will run on Fridays and Saturdays between Dalston Junction and New Cross Gate. The launch extends the existing Night Tube services, which have seen more than nine million journeys and helped cut evening journey times. Night Overground services will not call at Whitechapel station initially due to Crossrail works, which will finish in summer 2018. Services will be extending to Highbury & Islington next year. Mayor of London, Sadiq Khan, said: "It's absolutely fantastic that we have got the Night Overground up and running in east London, building on the huge success of the Night Tube. "Londoners and visitors alike will be able to use the service to help them enjoy everything that this buzzing part of the city has to offer as well as providing a significant boost to the night-time economy." Night Tsar Amy Lamé said: "From Dalston to New Cross, the "ginger" line is world-renowned for its incredible night life and diverse culture. "Ensuring London thrives as a 24-hour city is a top priority for the mayor, so I'm delighted the Night Overground is joining the Night Tube in providing a safe and efficient service to thousands of passengers - whether they're partying all night, or working to keep the city ticking around the clock."